Jeep prides itself on its reputable brand, quality, and consistency. That is why every model attempts to offer more than the previous one. If a Jeep Wrangler has crossed your mind but you are stuck between the 2018 or 2019 model–we’re here to help! The All-New 2018 Jeep Wrangler had a completely new redesign while upholding its legendary reputation that the 2019 Jeep Wrangler imitates. Its toughest battles made the Jeep Wrangler win the top MotorTrend SUV of the Year® with 35 other SUVs. Both models have excelled in value, performance, safety, advancements in design, and engineering that will keep them alive for years to come. Four trim levels: Sport, Sport S, Rubicon, and Sahara will continue to be available. The 2019 Jeep Wrangler (JL) will include a diesel-engine option and a special-edition model. A new Jeep Wrangler pickup model: the All-New Gladiator is also anticipated to arrive in Spring 2019. Although the differences between the two may be subtle, they make a bold statement. For our adventure-seekers out there, the MOAB™ edition on the 2019 Jeep Wrangler is outfitted with rugged design cues that give the Jeep Wrangler a new name. It features a dual power-dome vented hood, front and rear black tow hooks, leather-trimmed interior, and steel bumper and rock rails. Find the Jeep Wrangler that fits your thrill for adventure. 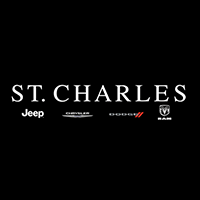 Let the St. Charles Chrysler Jeep Dodge Ram Team help you find the best one!